Can robots be viable sources of art? From cave paintings to modern pieces occupying galleries today, art has been widely deemed a human creation. But as robots continue to accomplish human behaviors, it comes as no surprise that designers in Japan have come up with the “Senseless Drawing Bot,” a system of two pendulums on an electric skateboard that arbitrarily sprays paint onto a given surface. Designers So Kanno and Takahiro Yamaguchi have constructed a device that surpasses the binary, predictable nature of input/output machines and have instead created something that produces art semi-chaotically. This is not your average spray paint machine, folks. Although the bot uses a program called Arduino to create algorithms for movement, the creators say that the double pendulum ensures a distinct outcome every time. The results look like nonsense street art, with endless loops and waves of color. Would Kandinsky or Pollock approve? 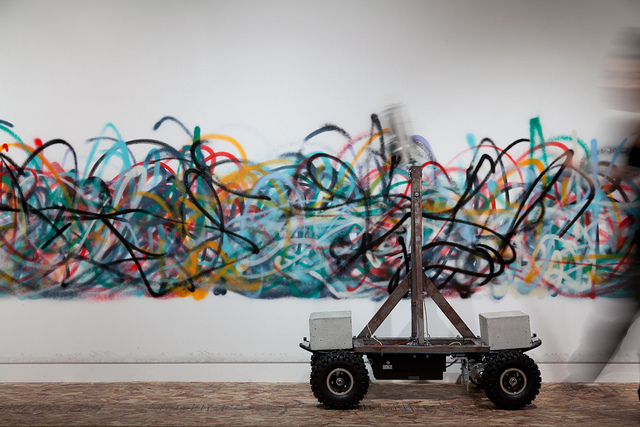 The case for robots in art is a gray area, but for now we just think it’s pretty cool.